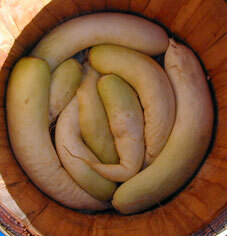 Takuan (沢庵), also known as takuwan or takuan-zuke, is a popular traditional Japanese pickle. It is made from daikon radish. In addition to being served alongside other types of tsukemono/Japanese-style pickles in traditional Japanese cuisine, takuan is also enjoyed at the end of meals as it is thought to aid digestion. 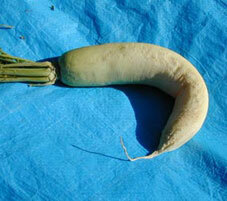 Takuan is made by first hanging a daikon radish in the sun for a few weeks until it becomes flexible. Next, the daikon is placed in a pickling crock and covered with a mix of salt, rice bran, optionally sugar, daikon greens, kombu/Dry seaweed, and perhaps chilli pepper and/or dried persimmon peels/even flowers for colouring. 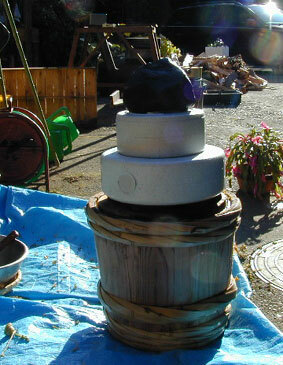 A weight is then placed on top of the crock, and the daikon is allowed to pickle for several months. The finished takuan is usually yellow in colour, although most mass-produced takuan rely on food coloring for this effect. Takuan is popular also in South Korea, and is called danmuji (단무지). It is used as a filling for gimbap, or as an accompaniment to Korean dishes, typically jajangmyeon. 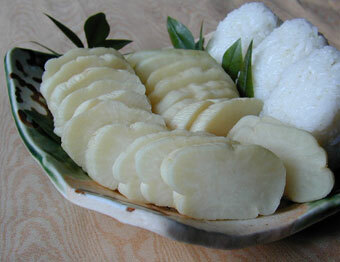 Here is a simple basic recipe to make when you get hold of plenty cheap daikon. Since it is vegan in nature, it shoild please everyone! Check the extra recipe for ideas! INGREDIENTS: Bear in mind that the bigger the batch, the better! -Daikon: 10~15 with their leaves! Wash the daikon with their leaves. It is important to dry them with their leaves as to prevent a loos in quality. Place them to dry in a spot well exposed to the sun and wind. Let them dry for 1~2 weeks. Bring them inside at night if you think morning dew will come on them! They will be ready the moment they bend easily. -Wipe daikon with a clean towel. 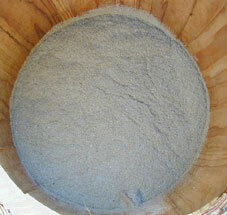 Weight the daikon then and prepare rice bran (15% of daikon weight) and salt (6% of daikon weight). -Cut the leaves with the end of the daikon. 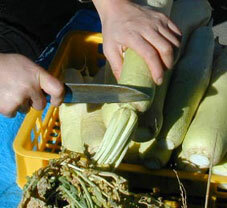 Cut enough of the daikon so that the leaves hold together. Put leaves aside. You will use them later! -Put each daikon (work on one at a time) on a working table. Roll it by solidly pressing your palms on the daikon all along its length to soften evental hard spots and even the humidity inside. 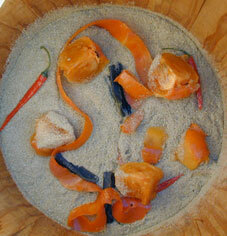 -In a separate bowl pour in the rice bran, salt, brown sugar, chopped konbu/seaweed, chopped chili pepper and white sugar. Mix well. -Use a large pickles jar/bucket. First line the bottom with some of the pickle mixture. Line a first layer of daikon, leaving as little sapce between as possible. Fill any space left with the daikon leaves. Repeat same procedure with the rest of the daikon. -Line the top with the remaining daikon leaves. Press down with your hands, putting all your weight behind your hands. Sprinkle some extra salt over the top to prevent mold from forming. You can use a special pickle vat as in picture above and screw down the lid for maximum pressure. If you uve a normal vat, plce a clean wooden or plastic circle on top of the daikon and lay a weight/stone at least 3 times the weight of the daikon. -Pickle for 4 weeks in winter, or 3 weeks in summer. Clean them quickly in clean cold running water before cutting and serving them! SECOND RECIPE: Traditional but the process is the same! Look at the pictures, the process is the same! Putting the weights on top! how long will the product keep after it is ready? If properly refrigerated, at least a year! Hello! Such a great recipe thank you for sharing! I have some brown spots on my daikon after they have dried, should I remove them? Also other recipes say that if the daikon is wrinkled that it is no good, what is your opinion on this? It would be best to remove them indeed! When you start layering the daikon and rice bran, do you cover each layer of daikon completely with bran so that the next layer of daikon isnt in direct contact? How thick should the rice bran be? Dear Sam, as long as the bran fills all the spaces between the daikon, it is fine! Don’t worry about the thickness of the layers! Is there a problem if I don’t fill in the gaps with the leaves and use rice bran instead? Do you know why the top layer should be all leaves, does it mold otherwise or something? Sorry for all the questions, I don’t won’t 10kg of dried daikon going to waste. I live in a small town in Alaska and have had a bit of success with homemade takuan pickles. The only daikon that I’ve been able to get here (so far) arrives as chunks of fresh roots, some big/some smaller, no leaves at all, and even the root end cut off so there’s no tapering. I’m wondering if you would proceed as normal with what’s available OR whether you would substitute another green for the daikon leaves? Your instructions are excellent and parallel my macrobiotic cookbooks which are the bottom line for me. I like your percentage of weight guidelines, (I use percentages when I make sauerkraut), I would use no sugar or other sweetener at all, and I like the plain daikon color. Thanks very much. Takuan comes in many guises. Using the leaves is basically to save and use all available parts of the vegetable. Many farmers here dispense with them and make their takuan with lengthwise half-cut roots only. In some areas of Japan leaves will come out bigger and easier to preserve whereas in other areas the leaves will wilt fast, therefore there is no general rule. You just do with what you have. 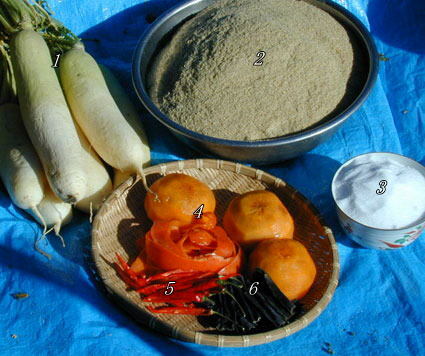 Incis\dentally daikon seeds are easy to find and it might be a good idea to cultivate them yourself or with the help of a local farmer friend! In Alaska, you should use the same cultivation time as in Hokkaido, that is, seed them in May or July and harvest them in July or October, unless you can do it in green houses! If you get too many fresh leaves, don’t worry! Here we chop them fine and fry them in all kinds of styles (my own recipe is to fry them with chopped bacon, soy sauce, mirin, sake and pepper). You can eat them hot or cold later! If you have any other questions, do not hesitate! Hello Robert-Gilles, Thanks so much for this response, you’ve beautifully pointed me in the direction of workable solutions. For my next attempt using your instructions I’ll buy daikon available here (btw, great photos too) AND I will grow some next year and/or ask a local farmer to include them. I do wonder about root maggots and daikon, but one step at a time. Those critters “won” less this year than last year in my garden :-). Yes!, I have eaten the greens, (back in Boston one could buy daikon whole) and I know I at least put them in miso soup. I believe I’ve even bought takuan with some of the leaves included. Your own recipe sounds delicious. Thanks for being out there and for such a quick response. Looking forward making the pickle, but please can you tell me where to buy the pickle vat. I have been looking in internet and I can`t find it anywhere. Many thanks. Any large pottery vat should do. If you can’t find any use a metallic one! I just finished it, it’s a bit salty. I would like to store it in jars in the fridge, would I add a salt/sugar water mix to keep it moist like you but at the store? Or would I just put it in the rice bran mix in Tupperware? If you think you can use quickly, just wash it and keep it in the refrigerator well-sealed inside a Tupperware! If not, keep the whole in a Tupperware and take some out when needed. Thanks for your write up, I can’t wait to try this recipe, I am a week into drying the daikon now! My question is that can I keep the pickling vat outside or will the temperature fluctuation kill my pickling? I would advise you to pickle your daikon inside a dark room with a constant temperature for best results! If you live in a cold country leave the vat under a verandah with an awning! How do you store the takuan pickles once they are ready? Some people say to store them in the refrigerator, but other people say that this can change the taste of the pickles over time. And also if you make the takuan in a big batch, as the recipe suggests, you won’t have much room in your refrigerator for anything else!!! Can’t you just leave the takuan in the nuka vats, taking them out and rinsing them for use as needed? It seems like this would be simpler method and more common in the days before they had refrigerators anyway, right? Or is there another method for storing these so you can use them as needed without taking up all the space in your refrigerator? Unless you live in an extremely hot country, keep the takuan in their vats with nuka properly closed in a dark place at constant temperature! The Japanese cover the vat with a vinyl sheet under the lid. If you have to keep them in a refigerator, wash them first and keep them inside Tupperware boxes! I’m at the end of week 2 of the pickling process using the pickling vat, and a brown liquid is forming over the top of the “compressor” lid inside the vat. It looks like a couple of tablespoons of liquid. Is this normal? I don’t see any mold. Should I dump out the liquid? This is normal, but you may discard it as it forms or mix the whole thing again! This is a wonderful recipe. I shall try it when I have both the time and ingredients. But it leads to a question. 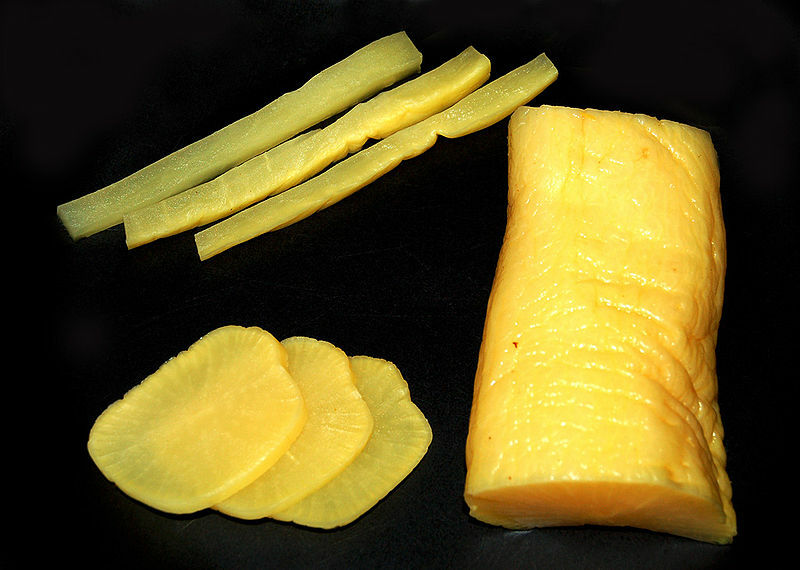 The recipe suggests that the traditional color is traditionally derived from fuyukaki peels. (Ignore the fact that artificial coloring is used in most modern commercial product.) But fuyukaki is very seasonal. Was daikon also a seasonal food? Or was some other coloring (or no coloring) used out of season? Both ingredients are in season at the same time. People make as much as possible until the next year’s crop! Now artificial coloring is not a good thing, is it? This is a terrific post! My grandmother uses something very similar to the first recipe to make her homemade daikon pickles. Can’t wait to try this recipe! Even though I think I am going to cheat and use a much simple method (but would not taste as good, or keep as long) but this is one excellent post. I really enjoy reading this traditional way of making pickled daikon. You are most welcome, ear Cindy! Hi, I wonder how it would work to mix a bit of saffron or tumeric into the nuka to color the takuan, or perhaps umbeyoshi paste or shiso powder, which would make the takuan a different color? Or perhaps tie-died takuan with different colors for different layers, bleeding into each other. MMmm the recipe made me hungry for takuan, and its 1:21 a.m. I’ll have to wait till tomorrow! You could! It’s all a question of personal taste, even here in Japan! As for the color the same! Great write up. Could you point me to a source for the traditional wooden pickling crocks with otoshi-buta such as the one in the photos above? So difficult to find! Much obliged for any leads you can offer. Thank you so much for posting this. It looks so authentic, interesting and delicious. Unfortunately, it looks too sophisticated for me to attempt making them myself…. You are welcome, but it should be easy! Hi! i’ve been looking for traditional recipes of Takuan and found your’s, among others. Some recipes say to mix the nuka with water, so it gets sand-like consistency and to add old vegetables to increase the fermentation process before using it for real pickles. And your’s don’t. Is it because is just a bed for the Takuan and not for several nuka-pickled vegetables? Is this time limit for other types of vegetables? What do you do with nuka when Takuan is ready? Cause i also read somewhere that there are nuka with 20+ years and so.. 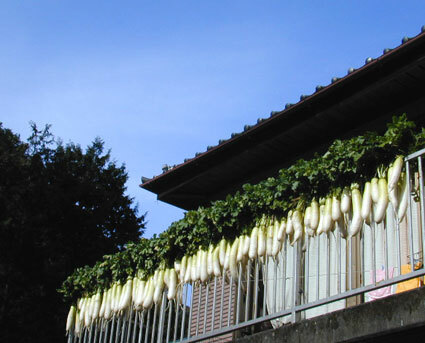 Does the takuan keep until next daikon harvest season?? Thank you for your patience and sorry for so many questions! My recipe is the traditional Japanese country one, so I suppose it would be more correct, but it is all a question of personal taste as takuan can greatly vary from region to region. Experimenting is the best teacher! The same about the length of fermentation. 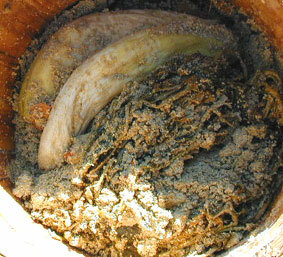 The takuan can be lightly fermented, from a few days to months. Once again, there is nothing to worry about it as it is again a question of taste according to colour and pungency. Some people like their takuan almost white, others a bright yeloow, others a dark brown! Usually nuka is discarded. 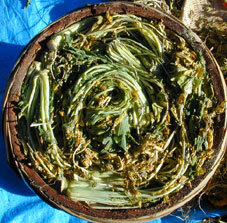 It is used as fertilizer in many farms! It could be re-used, but I’ve got doubts as to the health and hygiene! Takuan if properly kept inthe refrigerator will keep long enough until next season! I can understand your confusion. You have probably read about nuka-zuke, which are vegetables that are pickled for a few days in a specially-prepared bed of nuka. 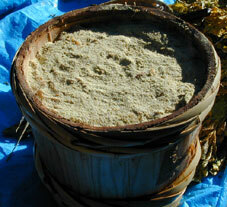 This is a different process and preparation from the above recipe for takuan! The nuka-zuke bed does, indeed, ferment, and with special care (stirring and airing daily, adding new nuka from time to time) is supposed to last many, many years. Not the same kind of pickle! thanks for sharing the recipe. the description and photos are excellen! once the daikon is finished, how long would it keep? what the best way to store it? If properly stored in a tupperware box and in the fridge, it will keep very long! The stuff they sell in Korea usually has a very bright neon yellow tone to it. I’m sure this version is healthier. Actually they also more yellow in Japan, but as you say that version contains less salt! Sounds delicious! Don’t know if I could wait that long though lol I’d be too antsy. I’m sure your boyfriend would love it! Ginger is a good idea, indeed! Of course with rice (ou know, the little left over!) is perfect! Love your meat balls pasta by the way!